There is another reason why it is not feasible to build a true pyramid, gradually rising but without first constructing a central core. Whereas in a step pyramid slight errors of alignment are hardly apparent and can always be corrected at the next step, the same is not the case for a true pyramid. Its edges must be straight and, at the same time, meet in one point which, in the early phases of construction, is high up in the sky and unattainably far from the building operations. It seems quite impossible that the Egyptians could have been in possession of sophisticated surveying methods or instruments to carry out this task. For a building of the size of the great Giza pyramids a tiny error of only 2° in the alignment of the edges will result in a mismatch of over fifteen metres at the top. Since the edges had to be straight from the outset, they could not be corrected later and had to be accurate to a fraction of a degree. The only feasible explanation would be the existence of a tall core building with a central marker set up on the top. That this, in fact, was the case, was proved by Robert who, in 1899, scaled the unfinished top of the Meidum step pyramid (E2) to set up a flagpole, a marker for the Egyptian Survey Department. He found the place already prepared by a 30 cm. deep hole in the centre of the structure which, he concluded, had held a mast. Somebody had set up a marker there more than 4,000 years earlier. It had evidently served as the required reference point in the sky on to which the pyramid edges of E3 could be sighted accurately. This fact and some of the observations mentioned in the preceding chapter allow us to trace the sequence of operations in erecting a large pyramid. First the site would be levelled and aligned in the cardinal directions by methods thoroughly discussed by I. E. S. Edwards. 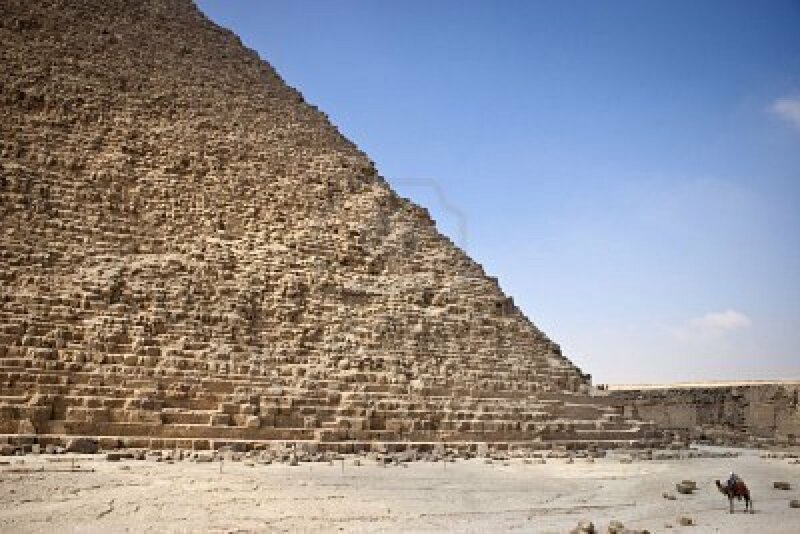 Then the erection of a step pyramid, consisting of core masonry held by a series of buttress walls, would begin. As this structure gradually rose, an ever-increasing number of the buttress walls would be discontinued with increasing height, leading to a succession of steps. Building material for the core would be brought on to these steps by building ramps, the relics of which exist to this day at the Meidum and Sekhemket pyramids. After the completion of the whole step pyramid, the marker was set up on top and packing blocks were laid on to give the building its pyramidal shape, the correct angle being checked by sighting on the marker. Subsequently, or possibly at the same time, the outer casing would be laid on, starting at the bottom, and finally it would be dressed to a plane smooth finish. The nature of the Meidum ruin suggests that workmen were engaged on these last operations simultaneously, since we see there the outer casing dressed and finished at the bottom while packing stones were still added at the higher steps. At the Bent Pyramid the core had reached a height of about 50 m. when it was decided to lower the angle of elevation from 54!° to 43J0, reducing its ultimate height from approximately 130 to 100 m. Two explanations have been proposed to explain the alteration as a reduction in height whereas in our opinion lowering of the edifice was not primarily important but the concomitant decrease in the angle of elevation was the really decisive factor. At this stage there will have existed only the unfinished central core with probably four steps, and buttress walls rising at an angle of roughly 750.